Looking for a warm and toasty drink? 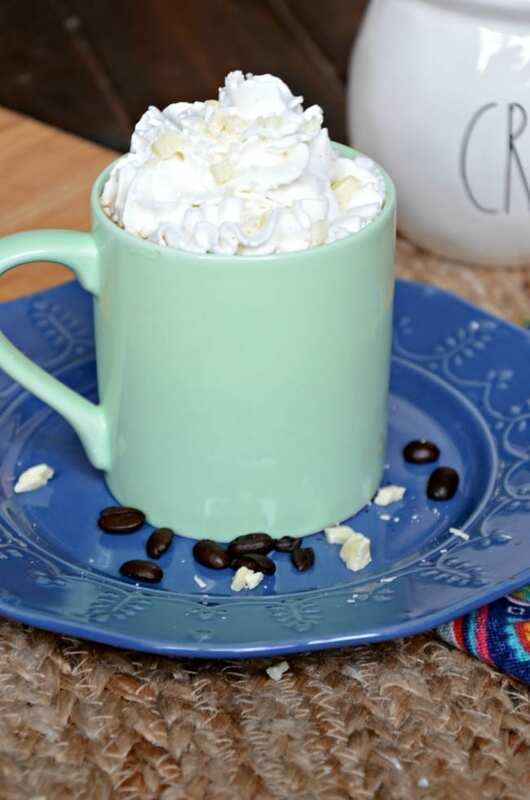 This white chocolate vanilla latte is full of white chocolate and coffee goodness with a sweet vanilla kick. One of my favorite things about this time of year is the return of the hot coffee. Don’t get me wrong – I drink coffee all year long. All day, everyday. But most of the time I drink iced lattes or cold brew coffee. It’s just too hot in South Texas to drink hot coffee most of the year. Now that the weather is cooling down I can bring back the hot coffee! One of my new favorites? This white chocolate vanilla latte! 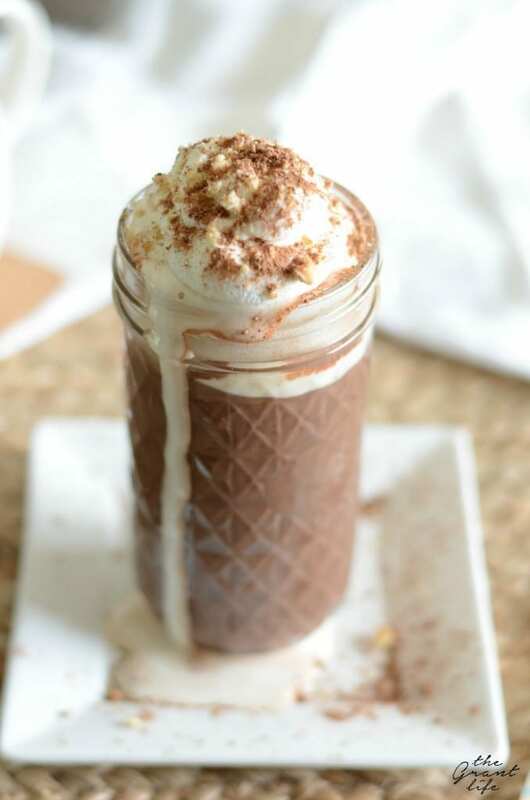 This latte combines a few of my favorite things together into one delicious drink. 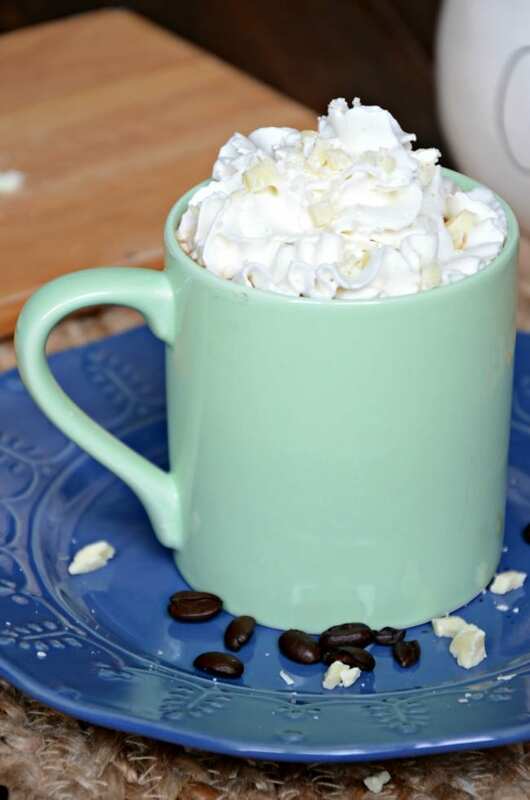 White chocolate is one of my favorite sauces to make and I just love putting it in my coffee. Once I have a batch of white chocolate sauce on hand then I can start experimenting with it and making new coffee recipes. That’s how this white chocolate vanilla latte came to happen. A little white chocolate sauce, a cup of hot coffee and a dash of vanilla all mixed together in one cup. When it comes to making coffee drinks at home, the better the quality the coffee, the better the drink will turn out. You want to use a good quality coffee or espresso for this latte. Either one cup of hot coffee, one shot of espresso or instant espresso all work well here. 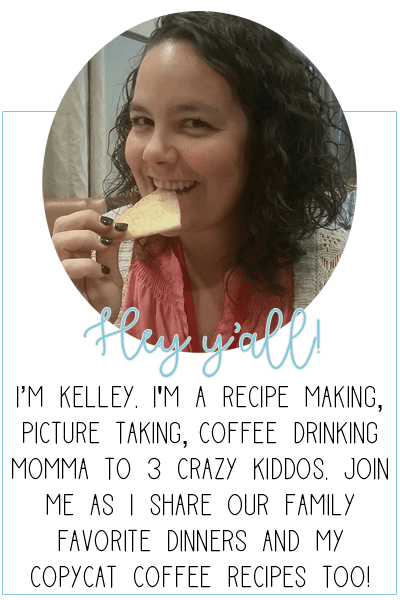 This is my favorite part – white chocolate sauce! 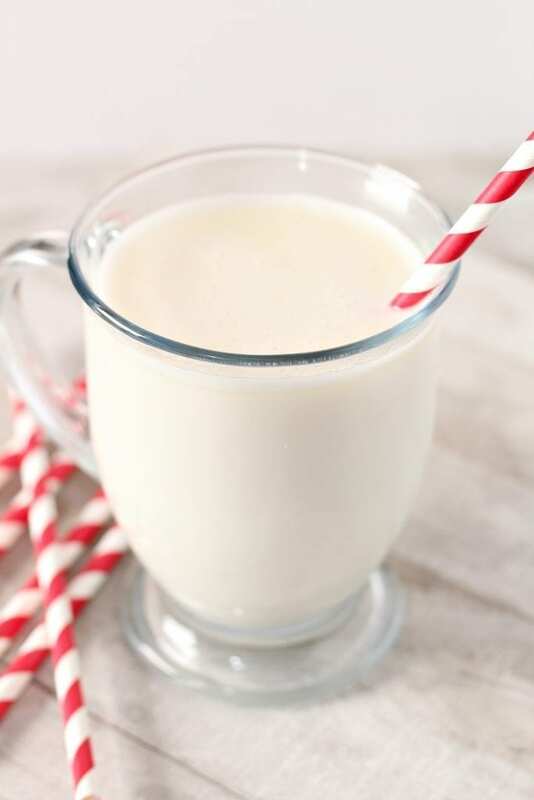 I love homemade white chocolate sauce because it’s easy to make and once you have it, you can make all the white chocolate drinks you’d like! (Hello white hot chocolate and iced white chocolate mocha!) Don’t want to go homemade? No problem! I always suggest using Torani white chocolate syrup in my coffee drinks. You want to use real vanilla extract in your coffee drinks and not imitation. Again, you can try a homemade vanilla extract if you’d like! When it comes to the milk, feel free to use whatever you prefer. Whole milk, almond milk, half and half. 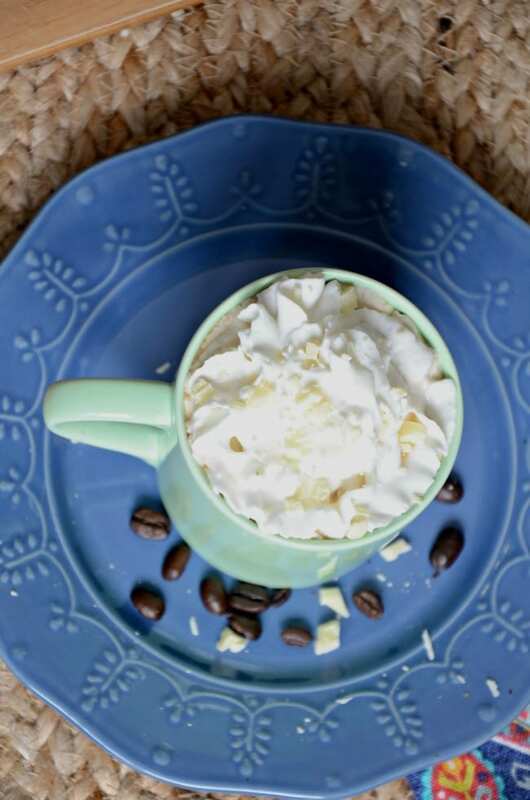 Any milk works great in this white chocolate vanilla latte recipe. I also suggest whipped cream and white chocolate shavings for topping. Totally optional, but also totally delicious! To start you either brew your coffee or make your espresso. Make sure they are strong and hot! Add your white chocolate sauce and vanilla to a mug. Stir in your hot coffee or espresso. When it comes to the milk you can either steam your milk or just add it in cold; whichever you prefer. If you want to steam it you can do it on the stove top. Warm milk until frothy in a pot on the stove. Remove and carefully pour it over the coffee. Stir together to combine. 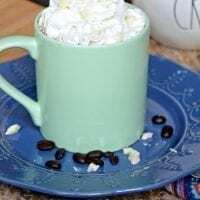 Top with whipped cream and white chocolate shavings and enjoy! 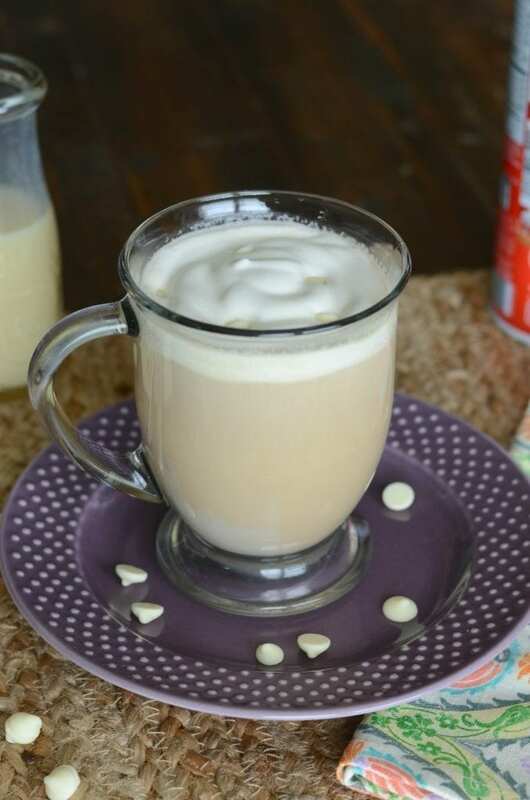 Make this white chocolate vanilla latte at home! It's sure to warm you right up. Pour your hot coffee or espresso in a mug along with your chocolate sauce and espresso. Stir to combine. Mix in your steamed milk. To steam milk on the stove top - heat milk in a pot on the stove until frothy. Remove and carefully pour into mug.